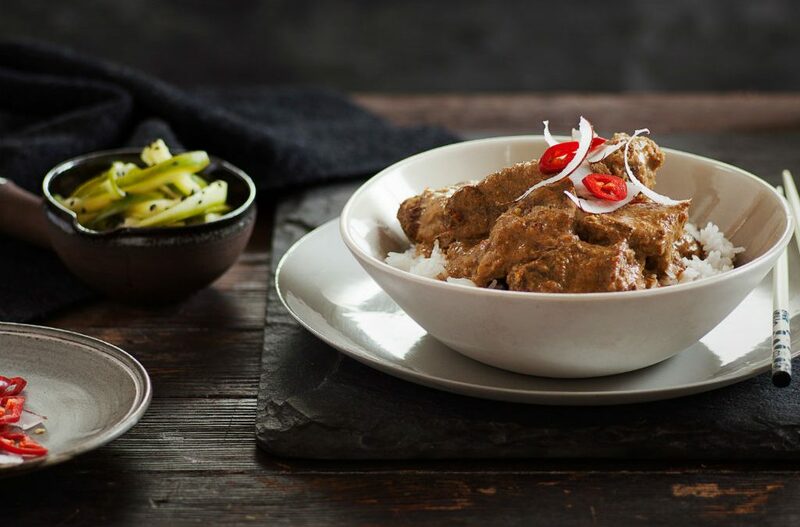 Beef curries are a family favourite, and this Malaysian rendang is no exception. Make it at home to master a weeknight staple with herbs and spices that fill the dish with flavour. To prepare spice paste soak chillies in hot water for 20 mins, drain. Process chillies and remaining ingredients to a form a smooth paste. Heat oil in a large, heavy based casserole dish over medium heat. Add spice paste and cook, stirring regularly, for 6-8 minutes until aromatic. Add diced beef and continue to cook , stirring, for 3-4 minutes until beef changes colour. Add curry powder and toasted coconut and cook for 1 minute before adding coconut milk and 200ml water. Bring to the boil, stirring regularly to prevent the coconut milk splitting. Reduce heat and simmer gently for 2 – 2 ½ hours until meat is very tender and the oil starts to separate from the coconut milk. Season to taste. Meanwhile, to make pickled cucumber slice cucumbers lengthways into fine ribbons. Heat vinegar, sugar and 80 ml water gently to dissolve sugar. Remove from heat and allow to cool for 10 minutes. Pour over cucumber and leave until ready to serve. To serve spoon rice into bowls and top with beef. Garnish with chilli and shaved coconut. Serve pickled cucumber to the side sprinkled with black sesame seeds.